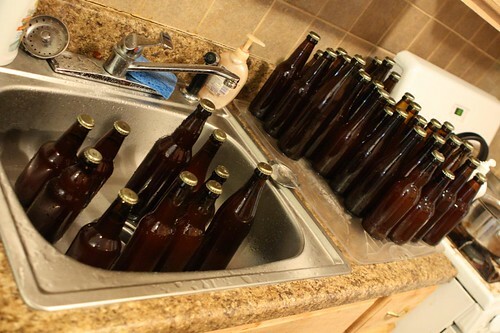 After careful planning, and lots of mild panic, today was finally the day to bottle my first batch of home brew beer. There were quite a few debacles including one where I accidentally used a bleach that, somehow, does not sanitize and disinfect to prepare everything for my batch. Thanks go out to all the dedicated home brewers who came out of the woodwork to offer advice and keep me sane. I woke up plenty early and got to work cleaning, sanitizing, cleaning again, and spending about 10% of my time doing things that related to the beer itself. 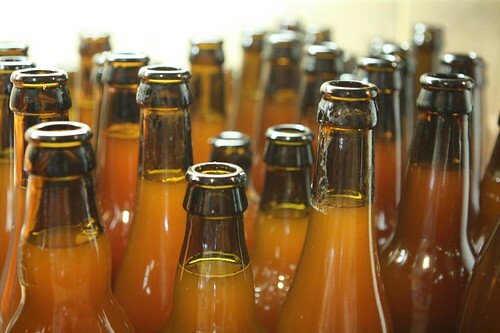 After a few hours I'd bottled and capped 36 regular bottles (both 250ml and 12 ounce) and 5 larger bottles (both 500ml and 16 ounce). At the end I had a motley assembly of different sizes and shapes all filled with a beer that I hope does not turn out to be disgusting. By 1:00 PM all bottles were cleaned, washed, and dripping dry. Afterwards I tossed them all back into the closet where they will ferment over the next 3-4 weeks. After the kitchen and apartment had been thrown into turmoil we had to clean our ways back into the kitchen and from there I started putting together a dinner of leftovers. 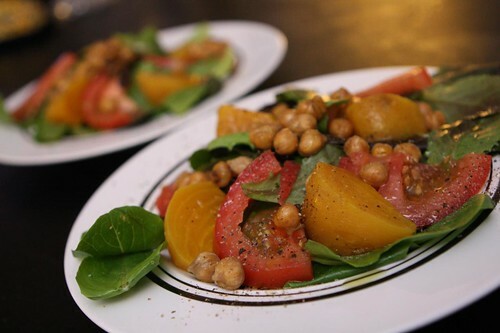 I started with this salad of baby greens, golden beets, tomato, and crispy chickpeas (which after several days had reverted back to regular chickpeas). I served it up with a little olive oil, salt, and pepper. 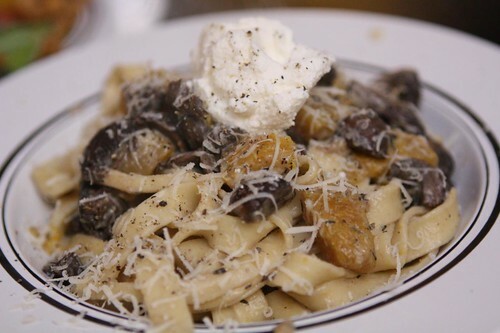 I took the leftover pumpkin and crimini mushrooms from the other night, threw them in a pan, added a little milk and cream, and added some fresh fettuccine. After tossing it together I added a dollop of ricotta and some freshly grated Parmigiano-Reggiano. After a long day of brewing that I would celebrate by having a beer that would be much better than the one I spent all day toiling over. 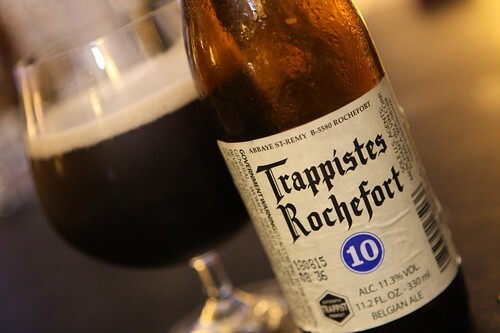 After having the 6 and the 8 it was finally time to have the 10 from Trappistes Rochefort. This was a delicious dessert treat after my long day of cleaning, bumbling, and sanitizing. I cherished every drop of this beer and I'm going to try to keep it in perspective that I am only one man and not a collection of Trappist monks. Jen's reward was to watch half a dozen episodes of Murder, She Wrote, her new obsession. Her reward was a bit cheaper than mine but it was okay because we both feel we got the better end of the deal. Jen hopes to someday be as stylish as Jessica Fletcher. I hope to someday be a collection of Trappist monks.